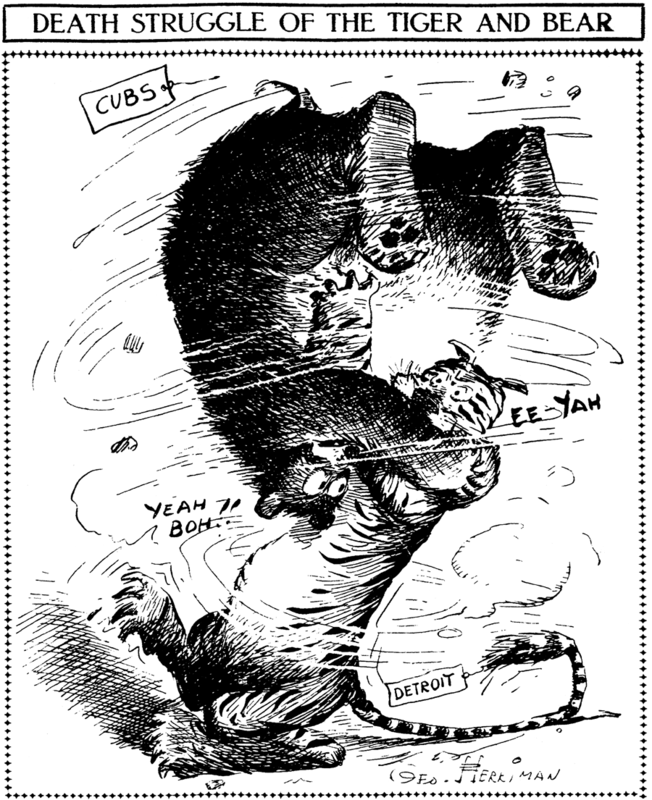 Saturday, October 10 1908 -- Today is the first game of the World Series, and it will turn out to be quite a barn-burner. 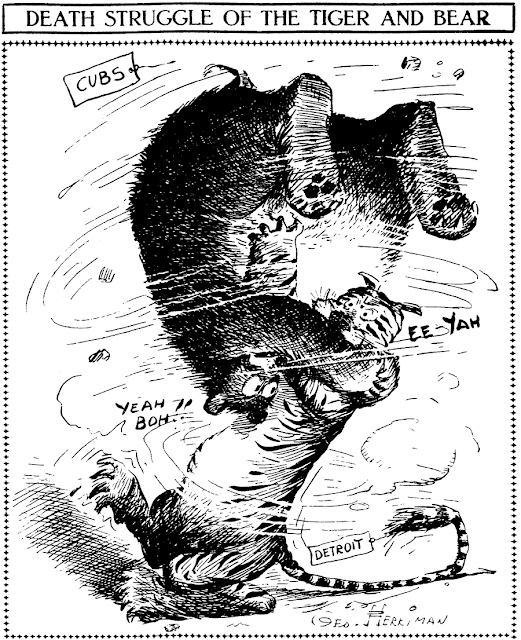 Of course Herriman had no way to know that when he penned this cartoon, but he made a good prediction that it would be quite the fight. I can't believe it! Some actual action, and shown to us instead of us just hearing about it! This is usually the talkiest strip in history. Don't get me wrong — I do like Connie. It is quite imaginative, and of course looks wonderful. But no one could accuse it of being all two-fisted action. It's not even one-fisted! Sometimes it's very hard to follow, since all that has happened is talk and more talk. And, of course, being locked in back rooms (or in grottos), and then finding a chink in the wall that either (a) lets Connie escape, or (b) lets her spy on the bad guys. But this week — an explosion! I think I had better go lie down, to recover. 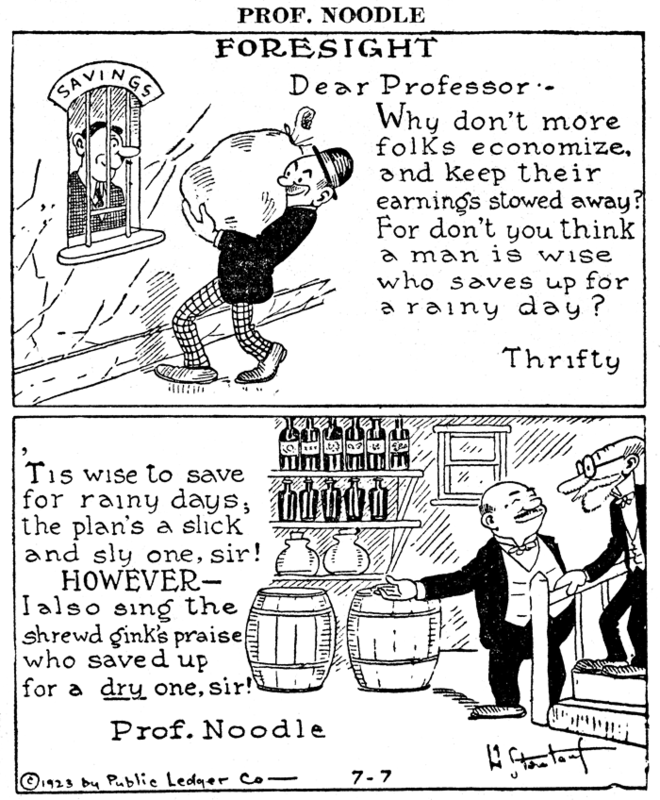 On January 15 1923, the Public Ledger syndicate of Philadelphia came out with a new panel feature titled Ask Professor Noodle - All Questions Answered by Hy Steinlauf. 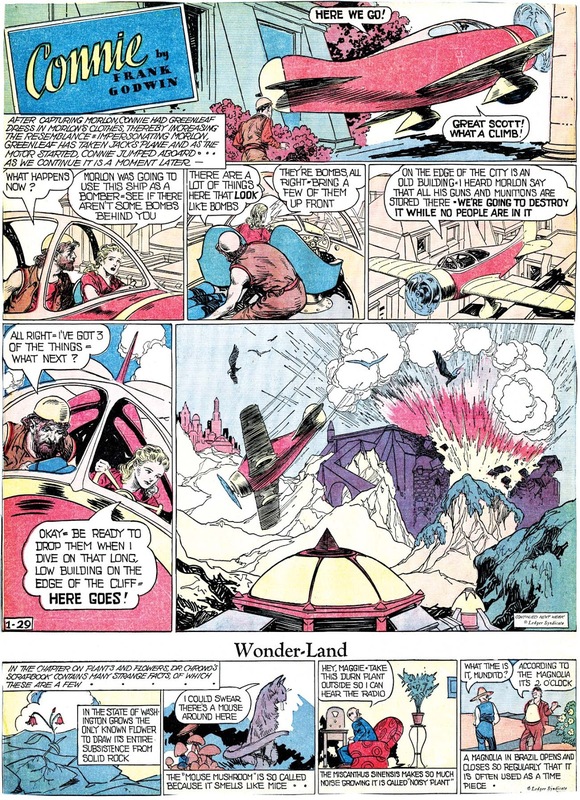 This was Mr. Steinlauf's only syndicated feature as far as I know, and it sank without a trace after little more than half a year on August 18, and what a shame that was. 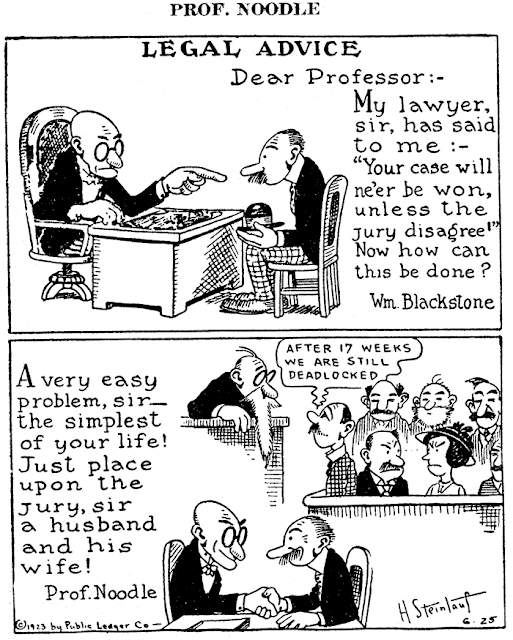 Steinlauf had a delightful acerbic sense of humor, and his cartooning, though not Art by any means, was a perfect complement to his writing. To gauge how much I like the man's work, I say this even though Steinlauf has a tendency to write in verse, and you know how much I just love that! Steinlauf's work reminds me a bit of Rube Goldberg, though I don't mean that he copied his style at all. He didn't. They just had a similar kooky yet well-grounded sense of irony and the absurdities of life. Whether the Ledger Syndicate's ineffective salesmanship was the feature's downfall, or newspaper editors just didn't share my high opinion, the fact is that Steinlauf's feature was an abject failure, and seems to be Steinlauf's only foray into syndication. What a shame. I hope that whatever else he put his hand to that it was also an outlet for his delightful sense of humor. I also remember a Professor Noodle in the LITTLE GUY back up stories of the Henry comic book published by Dell and later King/Charlton. I picked up a set of 1972 proof sheets on eBay awhile back for a strip called Navajo Canyons. I received the first two Sunday strips, which tell traditional Navajo folk tales, and the first week of a daily strip about a Native American named Johnny Navajo who has been educated in a white school and is now returning to his family out west. There is nothing particularly mysterious about a set of tryout strips that never got published, but there is one aspect of these that piqued my interest. Note that the Sunday strip above includes an NEA copyright slug in the final panel. That would seem to indicate that the strip was, at the least, picked up by the syndicate and marketed to their clients. Is that as far as it got? Credited creators are Jason Chee and G. Johnson. I find several Jason Chees in a Google search, including a Native American-inspired artist, but no current contact info. If Jason happens to read this, how about telling us what happened to your Navajo Canyons? Glen, who collected comic books, was working with several creators, Will Eisner among them, to create work books featuring the comic strips. 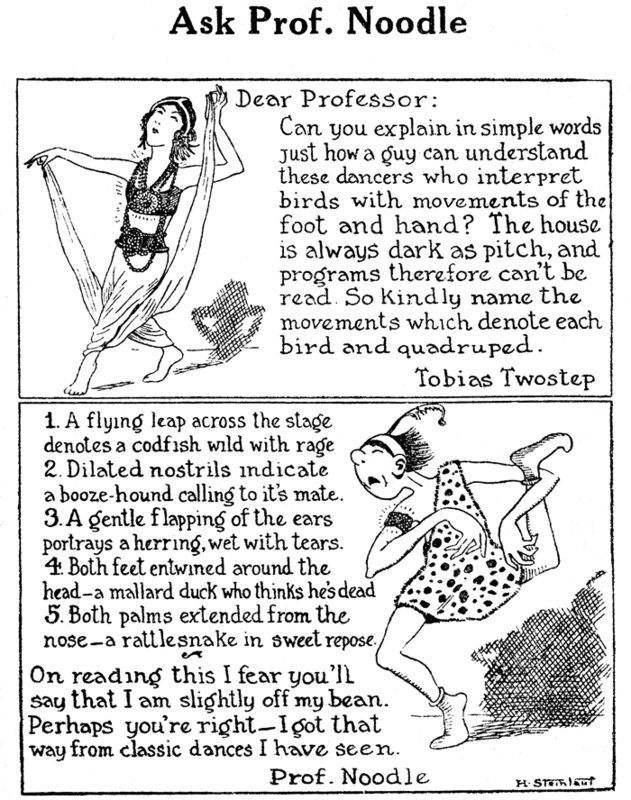 The children would read the strip on one page, and on the facing page would answer questions about what they read. 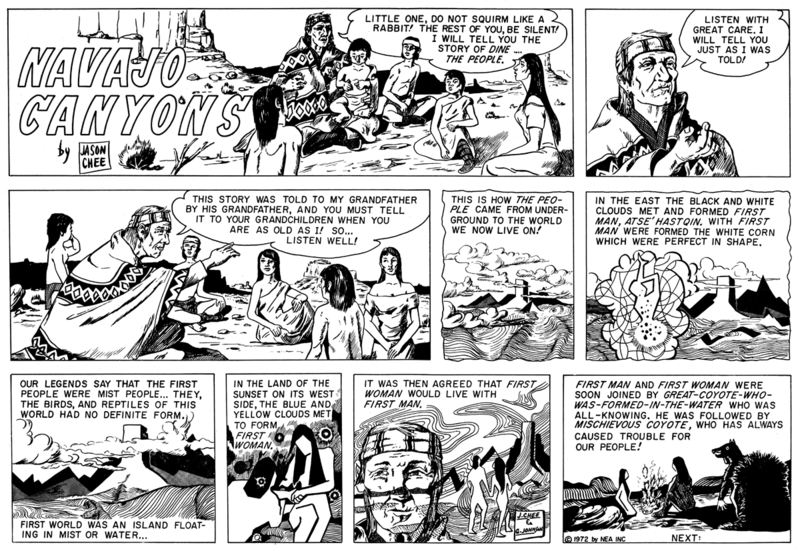 Glen had written to the NEA Syndicate looking for permission to use an Alley Oop sequence as a workbook, and the Syndicate thought a strip about the Navajos would be interesting. Glen got a friend, Jason Chee, to draw it, but the Syndicate rejected his art. 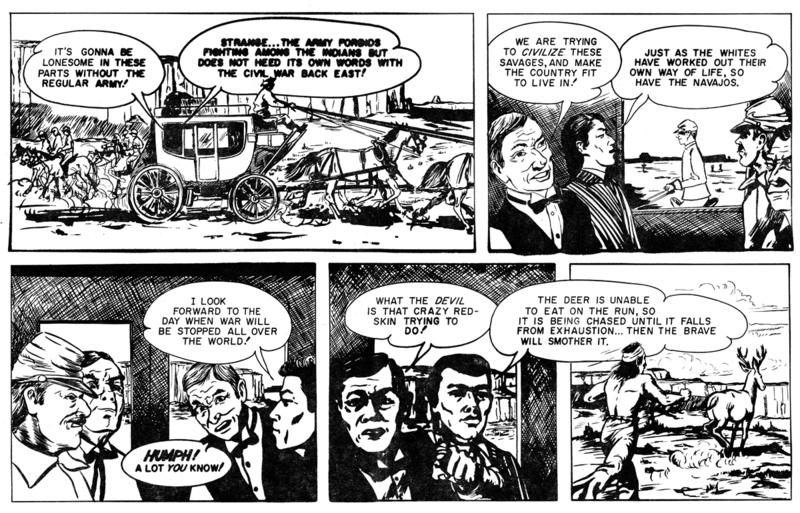 I remember seeing some other versions of the strip done by Creig Flessel. That version didn't sell to newspapers either. This all happened about 1970. I haven't talked to Johnson in years, but I believe my memories of the events to be substantially correct. You've got quite the memory, Pappy! Thanks for filling us in about Navajo Canyons. I know the Jason Chee who did this. He is a family friend and wonderful painter. I was just with him on the Navajo Reservation. I will have to ask him. James Joseph Maginnis was born in Glendermot, Derry, Ireland, on November 8, 1870. His birthplace was found at Ancestry.com, and his birth date came from his naturalization index card, also at Ancestry.com. The names of his parents, Charles Maginnis and Bridget McDonagh, were recorded on the marriage certificate of his architect brother, Charles Donagh Maginnis (1867–1955). Charles emigrated to the United States in 1885 and studied architecture in Boston. Church design was his specialty. Charles’s name was listed in many Massachusetts city directories. Ancestry.com has several Boston directories which list Charles including the years 1886, 1890 and 1892. James’s name also appeared in the 1892 directory, so he may have emigrated in 1890 or 1891. James and Charles resided at 267 St. Botolph and their occupation was draughtsman. Apparently, James had a similar education or training as his brother. James’s occupation in the 1894 directory said “Draughtsman Architect’s Office” In the next available Boston directory, 1897, architect James resided at 708 Huntington. “James J. Maginnis” was mentioned in the Boston Globe newspaper from 1899 to 1917. The spelling as “James J. Maguinnis” was also found. The 1901 and 1902 Brookline, Massachusetts city directories listed James as an illustrator at 5 Park Vale. Clark’s Boston Blue Book (1902) included James who was an active member of the Boston Press Club. His surname was spelled Maguinnis. 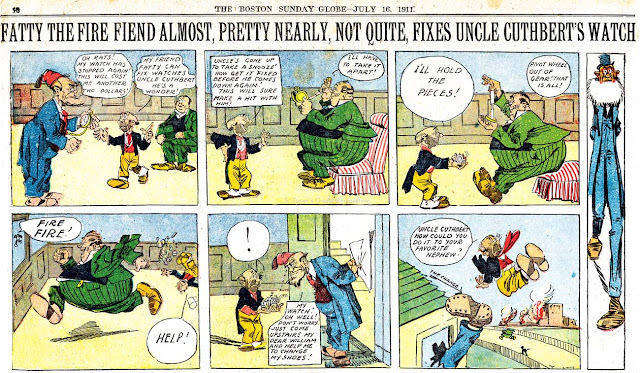 James contributed several comic strips to the Boston Globe. 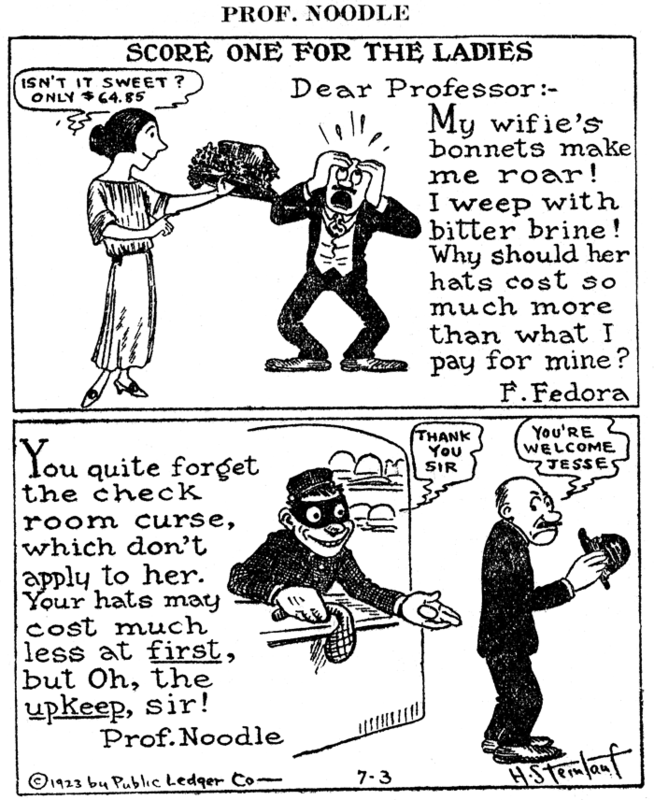 According to American Newspaper Comics (2012), the earliest one was The Loves of Artless Harry which ran from August 18 to October 27, 1901. A week after Artless Harry was Fuss and Gruff which ended in 1905. In 1902 James produced The Bully Boys and the Willie Boy, The Foxy Copper, and Hummer the Drummer. The following year he started Alec McSmarter, and Grandma and her Little Black Blossoms. 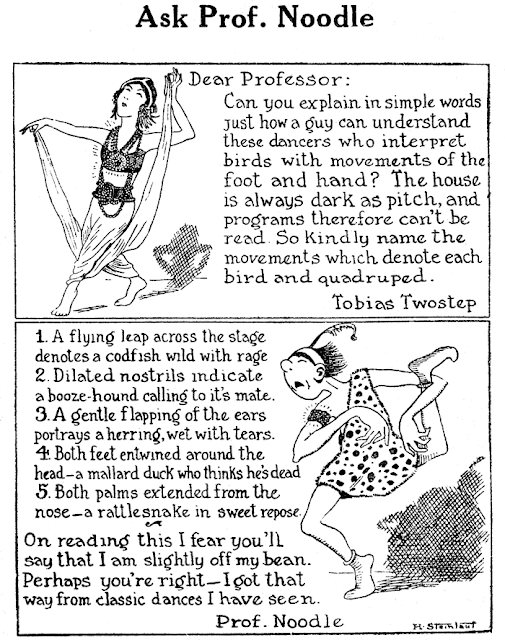 Artful Alice, Little Fritzy, Little Rube, and Wisewinkers appeared in 1905. Fatty and Bunion aka Fatty the Fire Fiend began in 1910. In the Philadelphia Press, James’s Herr Professor ran in 1906. James’s earliest comics contribution was for The Kaleidoscope, which was published the summer of 1897 in the New York Evening Journal. The 1910 U.S. Federal Census recorded cartoonist James in Winthrop, Maine. The Boston Globe wrote about James enlisting in the Canadian army during World War I. The article, “Former Globe Artist Confident That the War Will End Right” was published December 23, 1917. That article, or a version of it, was printed in Our Paper, December 29, 1917. Confident War Will End Right. James J. Maginnis. formerly a Globe artist, recently joined the 110th Royal Irish Regiment, and is now serving with the Canadian Expeditionary Forces. His age disqualifying for active military service on this side of the line, he crossed to Canada to join the Infantry Corps. Later, in more serious vein, he writes: “I hope that the war may continue until it is ended right, no matter how many years it takes, Even then, it may not be the end of all wars, but the world will have learned a memorable lesson. We know from individual experience that the only deeds that gives us happiness are good deeds. Nations are like individuals and they build their happiness on the ruins of their neighbors, and find no happiness. They will find it, however, eventually—all of them. “I can see mankind, out of pure selfishness, humbly recognizing the truth of the command, ‘Love one another,’ and just as sure as we all know that this is the eternal truth which will never change, just so sure am I that the German gospel of hate will be beaten and swept entirely from the earth.—Boston Globe. Ancestry.com’s U.S., Residents Serving in Canadian Expeditionary Forces, 1917–1918 had James’s birth year as 1873 and birthplace as Ireland. He was single and a New York City resident as of August 13, 1917. 1925 New York State Census recorded James at 75 Madison Avenue in New York City. The census said the cartoonist was naturalized in 1900 at Boston. There was a James J. Maginnis, age 74, listed in the 1940 census. He resided at the Stratford House, 11 East 32nd Street, New York City. In 1935 he lived in Summerville, New Jersey. Apparently he was retired because the space for his occupation was blank and he had no income because he did not work in 1939. In Brookline, February 15, Charles D. Maginnis beloved husband of the late Amy (Brooks) Maginnis, father of Alice M. Elizabeth, Paul F. and the Charles D. Maginnis, Jr.; brother of James J. Maginnis of New York City. Funeral from his home, 219 Dean rd, on Friday, February 18, at 9:15 A.M. Solemn Mass of Requiem at St. Lawrence Church, Chestnut Hill, at 10 o’clock. Relatives and friends are invited. Calling hours Wednesday 7 to 9 P.M. Thursday, 2 to 5 and 7 to 9 P.M. Kindly omit flowers. The date of James’s passing is not known. These days we gripe about drivers who slow down and gawk at traffic accidents. Back before the reign of the automobile, how did these annoying rubberneckers get their jollies? Why one way was that they went to see fires. Back when most homes were lit by gas and building codes were lax, fires were really common and people loved to watch the spectacles. 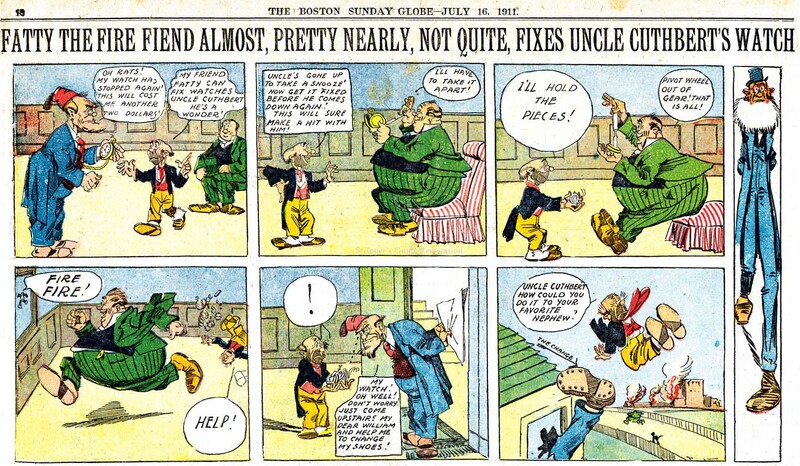 James J. Maguinnis created a strip about the phenomenon for the Boston Globe, making gags out of Fatty the Fire Fiend's willingness to drop everything to go watch a fire. The strip debuted on August 7 1910, which oddly enough was just a few days before a major fire in Boston wiped out twenty downtown buildings.